Taking a sherut in Israel is a fast and efficient way of getting around, but can be slightly daunting if you’ve never traveled on one before. A sherut (in Hebrew ‘monit sherut’ – service taxi) is a shared taxi, typically a eight to ten seat minivan, which runs on one of three routes – from city to city, within a city (usually along a bus route), and from the airport to Jerusalem and Haifa. The airport sheruts run either to Central Bus Stations or a destination of your choice, whilst the other sheruts in Israel follow a fixed route but can be stopped anywhere along their route (unlike a bus which only stops at designated stops). tourists it can seem bizarre for something so simple to be operating in such an advanced country because the sherut works very much like you would expect public transport to work in the third world! Sheruts will stop anywhere along their route so if you are not starting from a bus station, flag it down with your hand. The driver will stop if he has space, and if not, will normally indicate this by waving his hand. 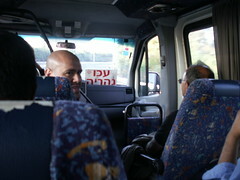 Unlike a bus when you take a sherut in Israel, you can sit down and then pay. When you get on the sherut, it is a good idea to tell the driver where you’re going just to be sure that he does go there. If the driver does not speak English, it is almost certain that someone else on board will, so there shouldn’t be a problem. Then go and sit down, check the price with the driver, and pass the money forward – tap on the shoulders of the other passengers and hand them the money. They’ll forward it to the driver and he’ll return any change. If you won’t recognize your stop, it’s a good idea to remind the driver where you’re going when you get near so he can stop and tell you when you get there. If you know where to get off, just ask the driver to stop when you are very close, and he’ll pull over and let you off. Within cities, sheruts follow pre-defined routes. In Tel Aviv, popular routes are Sherut line 4 and Sherut line 5 which roughly follow the similar bus routes through the city (they do not start and end in the same places as the buses but follow a very similar/the same route through the city center so check). In other cities, there are similar lines. These sheruts are numbered and generally very frequent. The fare for sheruts within cities is very similar to the equivalent bus fare. Taking a sherut is a great way to travel between cities because they run frequently (usually more frequently than buses) and they will stop anywhere along the route to drop you off (meaning that they make many smaller towns far more accessible). Popular sherut lines run between major cities i.e. Tel Aviv and Jerusalem or between Tel Aviv and Netanya, as well as from major cities to smaller cities. Sometimes, however, you might need to take a sherut between two big cities and then a sherut from the big city to a nearby town. For instance, to get a sherut from Tel Aviv to Hadera or Even Yehuda, you might be best to take the sherut from Tel Aviv to Netanya, and then another sherut from Netanya to Hadera or Even Yehuda. Sheruts between cities in Israel are not numbered, but advertise their destination in the front window. They generally run between Central Bus Stations along a semi-fixed route. The airport sherut in Israel is slightly different to the other sherut services because it will collect you or drop you at your front door. We dedicated a whole article to taking the sherut to and from Ben Gurion Airport to explain this better.